Comprehensive Profile (Abdullah A. Al-Badr). Comprehensive Profile (Badraddin M.H. Al-Hadiya). Analytical Profile (Mochammad Yuwono, Gunawan Indrayanto). Comprehensive Profile (Ibrahim A. Alsarra et al.). Validation of Chromatographic Methods of Analysis (Mochammad Yuwono, Gunawan Indrayanto). Polymorphism and Solvatomorphism 2004 (Harry G. Brittain). Whilst following in the footsteps of previous volumes by presenting comprehensive reviews of drug substances and additional materials, this title also heralds a significant expansion of the scope of the series. Traditional contributions are now augmented by publication of critical review chapters that summarize information related to the characterization of drug substances and excipients. This change meets the needs of the pharmaceutical community and allows the development of a timely vehicle for publishing review materials on this topic. 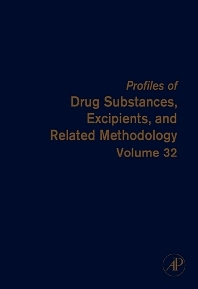 While offering comprehensive and specialised chapters, Profiles of Drug Substances, Excipients and Related Methodology, Volume 32 also presents a methodology review article on the validation of chromatographic methods of analysis, as well as a summary of the publications in 2004 that dealt with polymorphism and solvatomorphism.